Conversion rate optimization – so hot right now! I’m excited by it – because that’s where I’m headed, too. But it seems that there are still a lot of tough lessons to be learned about conversion rate optimization. With exactly ONE screenshot, I’ll teach you 5 quick lessons you can take to the conversion bank. Take a quick 10-second look at the following screenshot. 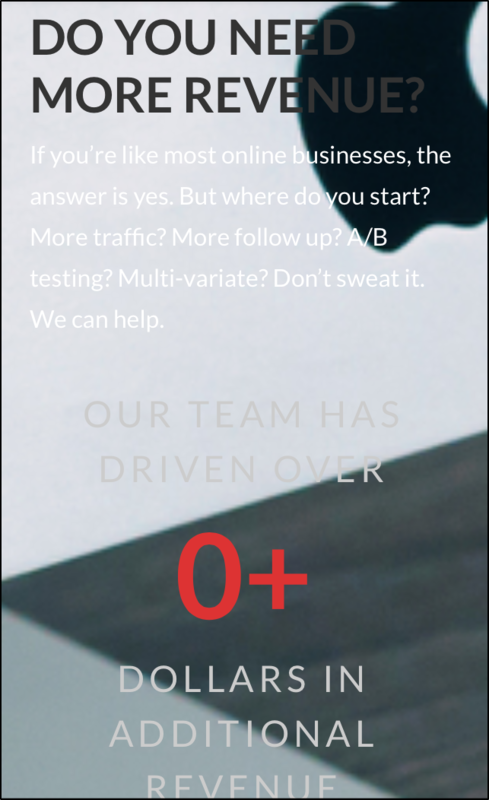 Full Disclosure: This screenshot came from a company that sells conversion rate optimization. This is not meant to be a mean-spirited shin-kick at a competitor. I’ve eliminated the name of the website and the URL for that reason. But if a self-professed CRO firm can still get all of this wrong, there’s a good chance the average business is making a lot of the same mistakes. 1. Test your site on every mobile device. On desktop, this site loads pretty quick. It’s got some HUUUUGE images, but the font is a reasonable size when you’re looking into a big screen. On desktop, that big, glowing “0+” quickly shoots up into a number that’s in the millions. As a user, that experience is supposed to “Wow” you. But on a phone, the page load speed is so slow that it hovers at “0+” for a good few seconds (like, 10 of them) – enough time to keep reading past it. Don’t let the tech you’re using or a slow page load squash the dynamic elements you’re trying to use to impress visitors. Otherwise, it can backfire – BIG time. Also, consider initial states of dynamic elements. If these guys had started their counter at $1,000,000, it would have been far more impressive, even if it didn’t load right. Your shiny parallax site might look great on a desktop, but if it loads slowly or collapses on mobile, ditch it. That autoplaying video with your demo in it? Mobile users won’t be so fond of you using up their data with your marketing. Before you go chasing cool dynamic ideas, make sure you’ve built a solid static foundation – then test the crap out of them before you push anything live. One of the things this section does right is using contrast to make that number to pop out (even if it’s a zero). Contrast is really important for bringing attention to the elements you want people to see. But it’s often the cousin of contrast, “Color”, that falsely gets the credit. More than “blue makes people feel calm” and “red makes people feel powerful”, your buttons and critical content need to pop out from the background. Don’t just test colors willy-nilly, think in terms of contrast. 4. …But so are context and heuristics. Also, the context in which we observe things will color our perception of them, even if we don’t overtly realize it. So what’s the context and heuristic this site has failed to acknowledge? When you’re dealing with numbers and dollar amounts, red is not a positive number. In fact, being “in the red” means having a net loss. Most business people recognize this (even if subconsciously) – so even when contrast makes the number pop, the context and its associated heuristic diminishes (or even reverses) that impact. 5. And readability trumps everything. It’s pretty easy to figure out where you’re going on this site. What’s not so easy is trying to actually read any of the content. Text over top of an image is SUPER popular right now, but it’s almost always difficult to read. When you make a reader strain to read, life is more difficult and they’re more likely to give up or miss critical information before reaching your CTA. Make sure all of your content is clear, obvious and legible. See? You can learn a whole lot about CRO in a very short time – you just need to know what to look for! Couldn’t agree more – I think many often forget to actually put themselves in the prospect/customer’s view and actually experience the journey. Hey Joel, found your site through inbound, great stuff! As far as having great contrast for content, I read in David Olgivly’s book. Far and away the most readable content is black writing on white background. Even though people love to mix this up, it has just been proven over and over again to be the most effective way to communicate. Honestly, I don’t know that in today’s day and age, it matters so much. As long as it’s clean legible, easy on the eyes, I’d challenge that notion – but then again, virtually every default GUI is in black and white, word is in black and white, and so on – so, take that how you will! I’m really happy I found your work – you have some phenomenal insights. Thanks for sharing them!